I’ve been dreaming about bees lately. I’m allergic to their stings, so it can be a bit alarming when they follow me around Dreamland. Nevertheless, I love seeing them in the garden and welcome their beauty and soft buzzing sound. A TED talk recently reminded me of how important bees are to our planet and food supply. Each one of us can make a difference if we plant a flower. Perhaps some of you see flowers as important only for their aesthetic beauty and regard vegetables as the practical heart of the garden, but that is not the whole picture. Without flowers, we have no pollinators, and without pollinators we have no fruits and vegetables. Recent field studies show that planting a few flowers can change the ecology of any landscape for the better as well as provide food for insects and birds. So please your eye and please your palate – plant a flower and make the world a better place. The Penn State Extension has a great guide for planting Pollinator Friendly Gardens. Doug Tallamy’s site Gardening for Life: Bringing Nature Home gives even more insight and suggestions on the importance of native plants for sustaining our natural world. Deborah DeLong has a lovely blog, Romancing the Bee, on urban beekeeping, gardening, and cooking with honey. This entry was posted in Flowers, Garden and tagged bee colony collapse, bees, bees in the garden, flowers, Louie Schwartzberg, Marla Spivak, pollination, Pollinator friendly gardens by composerinthegarden. Bookmark the permalink. I had to take out the very big snowball tree virbinum this week (it was failing over) I’ve become aware that I have sadly displaced a number of birds and insects pollinators. There is a sad hole in the garden but more sun . Thanks for this I’ll check out the link to pollinator garden for replacements. Carol, its always sad to lose a big plant but also an opportunity to replace it with something as good or better 🙂 Let me know what you replace it with – I would guess that your climate allows for many choices. Off topic … but are your ears itching today? Is there a reason they should, Frank? Ah ha … I knew they were itching. Hopefully, we can protect those resources, Jean. And a big thumbs up to those who have hives and provide us with the sweet results. You know I’m doing my part. It’s Oct. 7th and thanks to unseasonably warm weather, my gorgeous flower garden is still pumping out copious flowers and bees are everywhere. I had to stop wearing perfume when I sit amongst my flowers because the bees were settling into my hair and down my blouse. Yikes! Eleanor, I definitely thought of you while writing this, knowing that you surround yourself with flowers. Ooh, bees down the blouse – not good! Glad to hear your garden is still going strong; it is cooling down here this week and starting to feel like October. 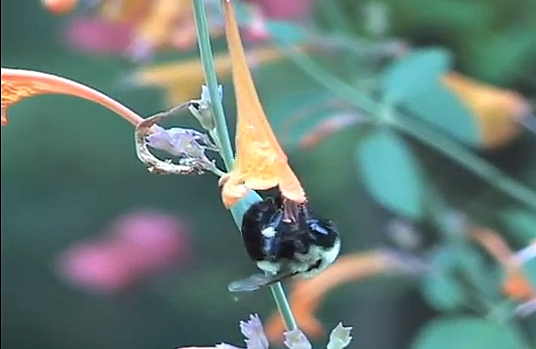 The pollination video is stunning! Many thanks!!!!! Glad you enjoyed it, Frank! I love Schwartzberg video! and very interesting talk. Too many people are using as an excuse of not planting flowers the fact that they are allergic – you are such a good example now that it shouldn’t matter! Thanks, I could watch his videos non-stop…. Our bees tend to be rather dangerous creatures. Nevertheless, I feel a bit guilty that I had a hive moved rather than reroute my path to the beach! Bees, like bats, are quite vital ecologically. That’s understandable, colonialist – I have to be very careful in the garden, but generally the honey and bumble bees are busy gathering pollen and I have to bump into them to get stung. The yellowjackets (wasps that look like bees) are, on the other hand, aggressive and dangerous – I avoid them at all costs. I get totally confused in countries where the wasps look like bees! I am used to them being segmented and slim, like miniature hornets. A fascinating talk that lady gave in the first video. I have heard tell, rightly or wrongly, that bees are more attracted to wild flowers and the old fashioned type of yellow flowers and that we used to have in gardens. Apparently they are not attracted to the more colourful and exotic species that we plant nowadays . Chris, you are right about the types of plants that attract bees. Simpler flowers with the pollen exposed are preferable, as well as ones whose color markings create a bee “landing strip.” Plants native to an area also evolve with the insects that feed on them, so the flowers of “native plants” are also important – that’s why “wild” flowers are so important in ecological systems. I try to mix natives in with my garden plants and I definitely see a preference on the part of the bees for the natives! I am reading a fascinating book by Simon Buxton called ‘The Shamanic Way of the Bee’ – absolutely fascinating! Jan, thank you for commenting; I will explore that book, it sounds fascinating. I’ve just followed some links to “The Pollen Path” which is a Navaho ritual that Joseph Campbell spoke about. You have a couple of EpiPens that you take with you to the garden and you know how to use them I trust. Our hiking group is a little older and has a couple of people that are really allergic to bee stings so they carry them and the whole group has learned how to use them in case they were ever called to do that; it is important. Oh, absolutely, Charlie – good point! They are with me at all times and I know how to use them. Thanks for asking. Sage advice, Lynn. Thanks for the reminder. Trying to do our part! Great (and important info). Thanks for sharing. Audry, you do your part SO beautifully!